This ruggedly handsome watch is great for everyday use. 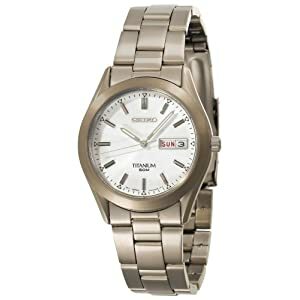 It has a titanium case and bezel, which gives it that cool gray-brown color. The white face and titanium hour markers look great together. Calendar shows day (in red) and date in the standard 3 position. Luminous hands and hour markers help him tell time in low light. It's water resistant to 50 meters (165 feet). It's classy and very lightweight - he might forget he has it on. Set the time once and forget it, because the quartz movement keeps it correct all the time. The watch looks great for business or casual settings. Its low profile even lets him wear it with a cuffed shirt. The band does not catch arm hair, which is great. Trust me, he'll love this watch. I know I do.